By learning risk factors, symptoms, and treatments of common eye diseases in the elderly, you can help protect your own personal vision and that of an aging loved one. According to the World Health Organization, 81 percent of all people who are blind or have moderate to severe vision impairment are aged 50 years and above. And with an increasing population of seniors, more people are put at risk of vision impairment related to chronic eye diseases. But by learning risk factors, symptoms, and treatments of common eye diseases in the elderly, you can help protect your own personal vision and that of an aging loved one. A cataract is the clouding and fogging of the eye’s lens, eventually resulting to the blurred vision, the most common symptom. 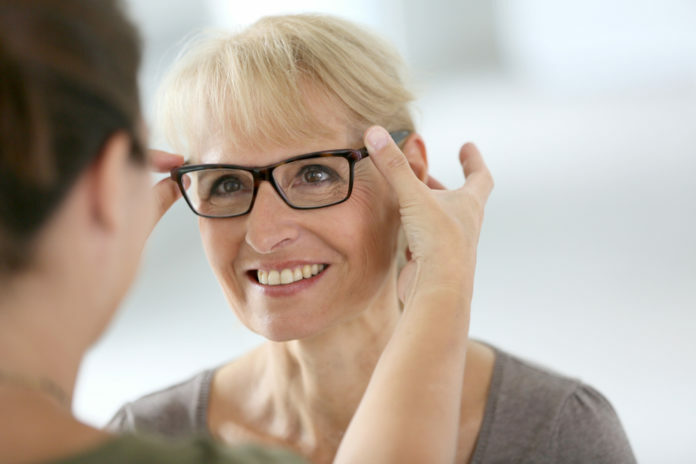 Blurred vision may be corrected with prescription eyeglasses or contacts, though the clouded lens may need to be replaced vision loss becomes too severe. Risk factors of cataracts include age (especially over 40 years), family history, genetics, and medical conditions such as diabetes. Individuals may be able to prevent or delay cataract onset and progression through a number of lifestyle factors, including the consumption of dietary antioxidants such as vitamin C.
Glaucoma occurs when the pressure within the eye is elevated, ultimately damaging the optic nerve and eventually leading to vision loss and blindness if left untreated. Risk factors for glaucoma include age, family history of glaucoma, the use of steroid medications, and near-sightedness. It is diagnosed through a comprehensive eye exam, with the goal of treatment to reduce the underlying cause of pressure in the eye in hopes to prevent against vision loss. Age-related macular degeneration (AMD) is the leading cause of vision loss in people aged 50 and older. While age is the most significant risk factor for developing MD, family history, race, hypertension, and history of smoking increases risk. AMD causes damage to the macula, or the central portion of the retina, which is responsible for focusing vision, controlling the ability to read, drive, see objects in fine detail, and recognize faces and colors. Though AMD is considered incurable, viable treatments can help slow its progression and enhance vision, including laser surgery, injections, and low-vision devices. Supplementation of vitamins may further protect against AMD, including the antioxidant-vitamin formula known as “AREDS.” Clinical trials sponsored by the National Eye Institute found the mixture of vitamins C and E, zinc, copper, lutein, and zeaxanthin can lessen AMD risk up to 25 percent! Also recognized as a diabetic eye disease, diabetic retinopathy is a complication of diabetes and a leading cause of blindness in American adults. Diabetic retinopathy occurs when diabetes damages the tiny blood vessels inside the retina, primarily related to regular high blood sugars and pressures. That being said, individuals can lower their risk of or prevent diabetic retinopathy by controlling diabetes and hypertension through lifestyle factors and medications as needed. Dry eye syndrome is a chronic and generally progressive eye problem that often comes with advancing age. It is often the result of insufficient moisture on the eye’s surface, which may be caused by inadequate production of tears or poor tear quality. Despite the underlying cause, those affected may experience a stinging or burning sensation, gritty feeling, pain, and redness in the eye, along with blurred vision and feeling as if their eyelids are heavy. Topical and prescription medications, lifestyle changes, and surgical options are practical treatment options. Cataracts affect more than 24.4 million Americans by age 40 and older. And by age 75, about half of all Americans have cataracts. Glaucoma affects more than 2.7 million Americans age 40 and older. Late age-related macular degeneration (AMD) affects nearly 2.1 million Americans aged 50 and older, while one in ten Americans has late AMD by age 80. Diabetic retinopathy affects nearly 7.7 million Americans aged 40 and older. And with diabetes rates on the rise, this number is projected to increase. Dry eye syndrome is estimated to affect 3.2 and 1.68 million women and men aged 50 and older, respectively. The high prevalence of eye diseases warrants the need for early detection and treatment, especially considering they often display no early warning signs or symptoms. Even younger adults are encouraged to start participating in regular eye exams in hopes to mitigate the severity of age-related eye diseases and lower their risk of eventual blindness. Additionally, individuals aged 60 years should visit an eye care professional for a comprehensive dilated eye exam annually. Nonetheless, despite the age and even if not experiencing vision problems, visit an optometrist to determine the frequency of eye exams, which mostly depend on individual and specific risk factors.